Metropolitan Family Services empowers families to learn, to earn, to heal, to thrive. Part mentor, part motivator, part advocate, since 1857 Metropolitan Family Services has been the engine of change that empowers Chicago-area families to reach their greatest potential and positively impact their communities. 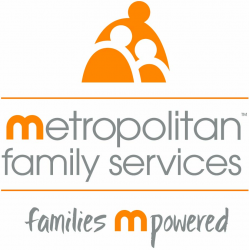 Metropolitan Family Services has more than 890 full- and part-time professional staff dedicated to providing quality services to families throughout Chicago, DuPage County, Evanston/ Skokie and the southwest suburbs. Metropolitan serves more than 72,000 families and individuals as diverse as the communities in which they live, with 81% being part of the working poor or lower-middle class.